The Brewers and Reds must have been getting antsy in their respective dugouts on Thursday night, because the teams mutually decided to hold their seventh-inning stretch a few innings early. Normally, the benches clear in baseball when there’s some sort of a confrontation, or a threat of violence. 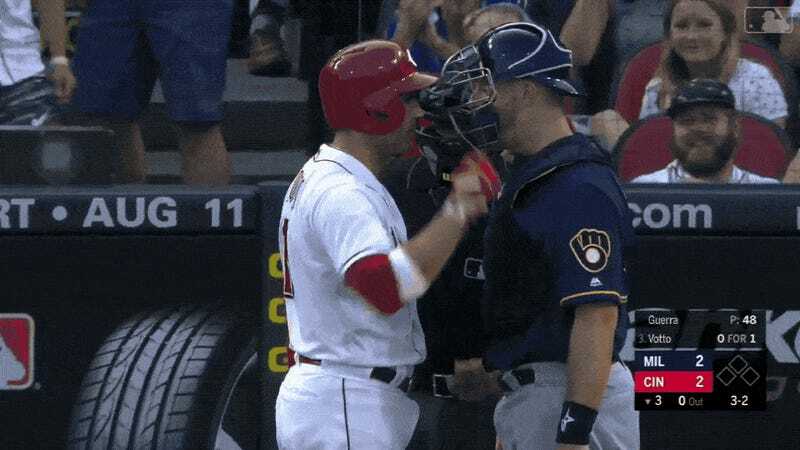 But in this case, everyone just must have been bored, because there was nothing but mild impoliteness in this conversation about balls and strikes between Reds hitter Joey Votto and Brewers catcher Erik Kratz. Nevertheless, every single player on both sides appeared to gather ’round the discussion, apparently so compelled by the sight of two men talking during a baseball game that they needed a front-row spot to observe. Even the dang bullpens got caught up in Votto’s magnetism, making the long jog from the outfield just to catch the dying embers of the impromptu convention. Baseball’s going to give us food poisoning from all of this fake beef.